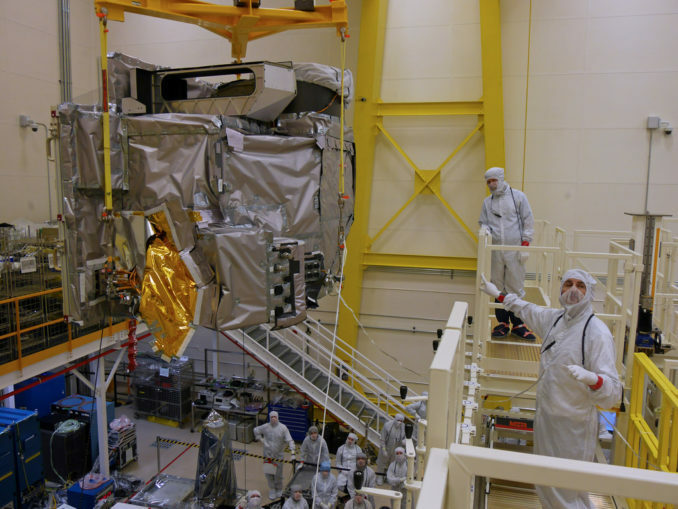 A cooling system aboard the satellite is unable to chill infrared detectors inside the Advanced Baseline Imager on GOES-17 to proper temperatures, degrading the camera’s performance. The imager is designed to be sensitive to light in 16 channels, including 13 infrared and near-infrared wavelengths, and three colors in the visible spectrum. The thermal control anomaly currently under investigation affects the 13 infrared and near-infrared channels, according to Steve Volz, assistant administrator for NOAA’s satellite and information service. 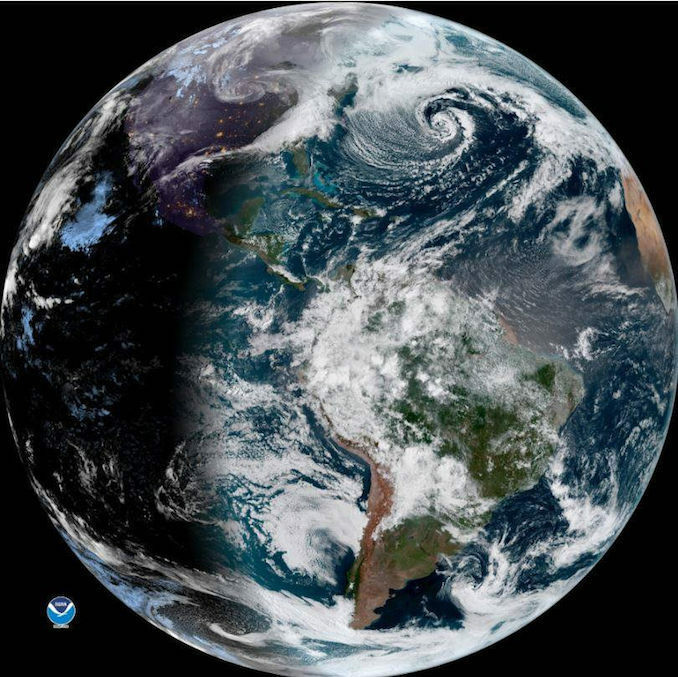 GOES-17 is parked in geostationary orbit more than 22,000 miles (nearly 36,000 kilometers) over the equator, where the satellite circles Earth at the same rate of the planet’s rotation, giving its instruments a fixed field-of-view. 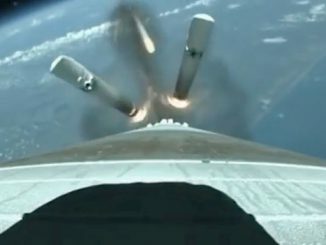 Since its launch March 1 from Cape Canaveral atop an Atlas 5 rocket, GOES-17 has activated its other sensors, including a lightning detector and space weather payloads, without any problems to begin a planned six-month test campaign. But the ABI is the centerpiece instrument on GOES-17. Designed and built by Harris Corp. in Fort Wayne, Indiana, the imager is intended to provide satellite imagery of clouds, cyclones, storm fronts, fog, wildfires and other phenomena for use by forecasters. It’s the same imagery that is regularly broadcast on television weather reports. An identical satellite named GOES-16 launched in November 2016, and it entered service late last year after a thorough checkout. 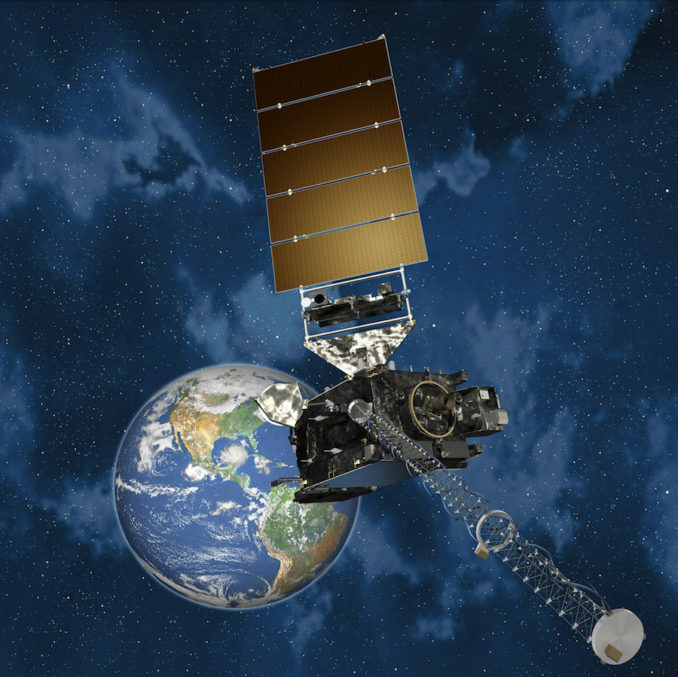 GOES-16, known as GOES-R before launch, was the first if four modernized weather satellites developed in an $11 billion program by NOAA. GOES-16 covers the eastern United States, the Atlantic Ocean and South America, with coverage extending to West Africa to track low pressure systems that could form tropical storms and hurricanes. The launch of GOES-17, previously named GOES-S, followed in March, and NOAA said the new satellite would begin observations by the end of the year to provide coverage over the western United States, including Alaska and Hawaii, and the Pacific Ocean extending to New Zealand. Joe Pica, director of operations at NOAA’s National Weather Service, said meteorologists also feed infrared data from GOES satellites into numerical weather prediction models, providing upper level and mid-level wind inputs and water vapor measurements to help improve the accuracy of forecasters. Those infrared observations are required not just at night, but all day. “If efforts to restore the cooling system are not successful, we are looking at alternative concepts and different modes to maximize the operational utility of this ABI for NOAA’s National Weather Service and other customers going forward,” Volz said. NOAA’s GOES-15 weather satellite, launched in 2010, is currently operating in the “GOES-West” location where GOES-17 was destined. The weather agency also has a backup spacecraft, the nearly nine-year-old GOES-14 satellite, in standby mode, ready to take over if one of the operational observatories fails. “We have two spacecraft that we could use to augment whatever we do in the GOES-West area,” Walsh said. The Advanced Baseline Imager carried on NOAA’s new generation of GOES weather satellites can capture more vivid views of storms than cameras aboard older weather craft, and record images quicker. The ABI can return scans of an entire hemisphere once every 15 minutes, half the time needed by one of NOAA’s earlier geostationary spacecraft. The imager can scan the continental United States once every 5 minutes. 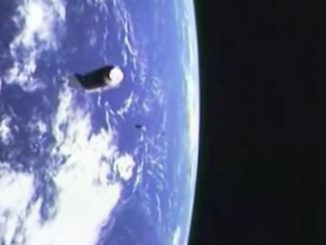 The new ABI-equipped satellites can return pictures of hotspots like hurricanes at a cadence of once every 30 seconds, an improvement from the five-minute rapid scans available today. The imager can simultaneously scan the broader hemisphere in its field-of-view and capture close-up views of individual storm systems, giving forecasters refreshed views of hurricanes and tornado outbreaks. The 16-channel ABI can yield deeper insights into moisture levels and cloud types unavailable with previous weather satellite images. Earlier GOES satellites had imagers sensitive to five different parts of the light spectrum. The upgrade allows meteorologists to distinguish between snow, fog, clouds, volcanic ash, and other particles suspended in the atmosphere. Engineers continue investigating the cause of the cooling system malfunction inside GOES-17’s imager, and officials remained hopeful Wednesday that the problem could be corrected, or at least mitigated. “We’re treating this very seriously with a multi-agency and contractor technical team to try and undertand the anomaly and find ways to start the engine, if you will, of the cooling system to function properly,” Volz said. “Doing this remotely from 22,000 miles below, only looking at the on-orbit data, is a challenge,” Volz said. The instrument is hottest while the satellite is over the night side of Earth because the sun is positioned off the limb of the planet, and shining in the camera’s aperture. The cooler is supposed to transfer heat from the instrument and discharge it to space via a heat pipe and a radiator. The thermal system works by cycling a fluid named propylene between the ABI instrument and the radiator. Engineers think they have narrowed the problem to the heat pipe/radiator system. “The problem is that the cryocooler, the mechanical cooler, is overheating because the heat pipes that transport heat from the cryocooler to the external radiator, that heat pipe/radiator system does not seem to be working as intended right now,” Sullivan said. Investigators are examining the performance from the identical imager on GOES-16, as well as similar imagers on Japan’s Himawari 8 and 9 weather satellites, which were also built by Harris and are working normally. But reduced performance could prevent forecasters from relying on the satellite as the primary weather sentinel over a broad segment of the United States and neighboring waters. “Whether we fix it completely or we do not fix it completely, how do we maximize the mission? I think that’s where the team is focusing right now,” Walsh said. NOAA has two more GOES satellites — GOES-T and GOES-U — set for launch in the coming years. They will host the same type of Advanced Baseline Imager as GOES-17. Volz said it was too early to say whether NOAA could move up the GOES-T launch date to replace the observing capacity that GOES-17 was expected to fill. GOES-T is set for launch in May 2020, followed by GOES-U in 2024. NASA, which oversees the launch of NOAA weather satellites, has not selected launch provider for either mission, but United Launch Alliance’s Atlas 5 rocket and SpaceX’s Falcon 9 launcher are expected to compete for the contracts. The four new-generation GOES spacecraft are manufactured by Lockheed Martin. “The first thing we need to understand the anomaly and whether or not it affects the other elements, the GOES-T and U spacecraft and missions, because those ABIs are complete and are in our hands,” Volz said.